Personal protective equipment manufacturer Alpha Solway has enhanced its Alphashield range of lightweight Type 5/6 coveralls with the launch of its 2200 – featuring fully bound seams. Providing highly effective head to ankle protection against a range of particulate hazards and light liquid splashes, the new Alphashield 2200 is ideally suited for workers across a range of industry sectors including pharmaceutical and electronic manufacturing, bodyshop, paint spraying, resin and fibreglass applications through to environmental and crime scene investigation applications. Manufactured from a microporous polyethylene laminate, the key to the 2200’s performance lies in the strength of its fully bound seams, which deliver greater strength and protection by overlaying two sections of material with an outer binding before being tightly chain stitched through all the layers. With seams of the 2200 bound in this way, the result is an extremely strong, highly protective and lightweight limited life coverall which, combined with the Alphashield material, provides enhanced durability. 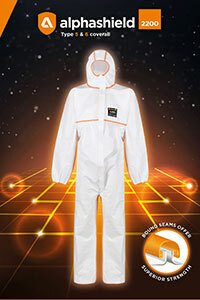 Indeed, EN ISO tests carried out on the 2200 have proven it to be one of the strongest for seam strength – unlike many Type 5/6 coveralls on the market today that can easily rip and split exposing the wearer and their immediate environment to contamination. By utilising microporous material, warm air is able to escape and keeps the user cooler for longer. The addition of thumb loops prevents the sleeves from moving up during use, keeping the wrist and forearm covered whilst the elasticated ankles, wrists and waist provide a better fit. The innovative three-piece elasticated hood construction also provides the wearer with added comfort, durability and fit. “The 2200 is a fantastic addition to the Alphashield family. The first to offer fully bound seams, the combination of protection and durability make it a great quality option for environments where contamination control and prevention is essential,” said Nick Moore, Product Development Director for Alpha Solway.